Watch the filmed sessions from the Conference and download presentations. showcase Australia’s quality agriculture through a short social program. The conference also featured side events hosted by CSIRO in Brisbane and the Australia Africa University Network (AAUN) in Sydney. See the full conference program for further details. Thanks to the high level of engagement by all participants, the conference was a huge success with the four objectives effectively met. Considerable energy, goodwill and support for the AIFSC and its strategy were evident during the events. The AIFSC mission of accelerating adoption of technologies by smallholder farmers was roundly endorsed. Quality discussion on the program areas was provided and further opportunities for AIFSC investment and partnerships explored. The CSIRO-organised farm visit and the Australia Africa Universities Network (AAUN) research day were very well received by delegates and the agriculture field day in the Hunter Valley showcased an impressive range of farmer entrepreneurship and Australian agricultural produce. The Conference was well attended by representatives from key pan-African, regional and national organisations including high level representatives from nearly all the AIFSC’s 10 priority countries, as well as representatives from key donor partner and international research agencies. 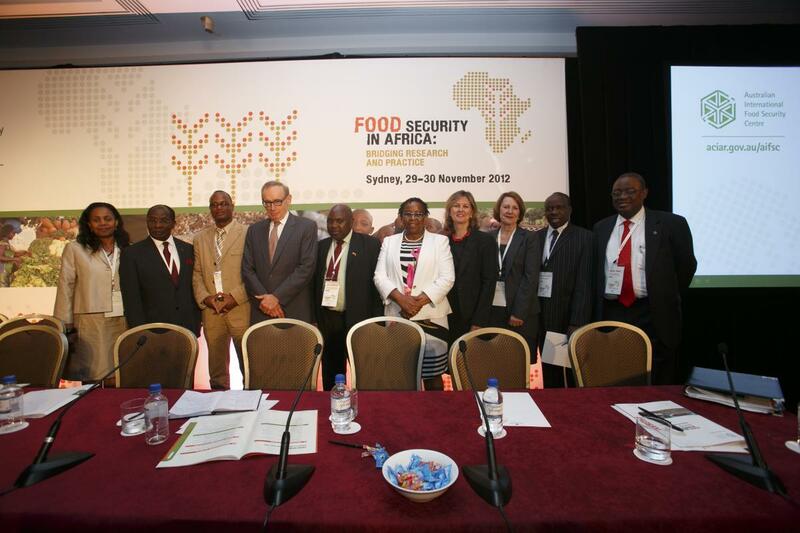 The AIFSC was formally launched by Foreign Minister Senator The Hon Bob Carr, while Her Excellency, Commissioner Tumusiime Rhoda Peace, the African Union Commissioner for Rural Economy and Agriculture provided a pre-recorded statement of welcome. Opening statements were made by senior Africans, including by the Malawian Minister of Agriculture, Kenyan Parliamentary Agriculture Committee Chairman and four Ministerial delegates, representing the countries of Mozambique, Rwanda, Uganda and Zimbabwe. The Zimbabwean Ambassador to Australian read a statement from her Prime Minister. The Keynote address was presented by Prof. Monty Jones (Executive Director FARA), who also provided closing remarks on behalf of his continental compatriots. The AIFSC strategy was formally introduced by Ms Mellissa Wood (Director AIFSC) and the rest of the program was structured around expert discussion on the AIFSC program areas, utilising panel sessions to explore key issues. Closing speakers included Dr Rob Bertram (Director USAID), Dr Jean Lebel (Vice-President, Canadian IDRC) and Dr Nick Austin (CEO ACIAR). See the launch program for more information, videos of the event and the speaker’s presentations. The event also received significant media coverage both in Australia and internationally - read more.